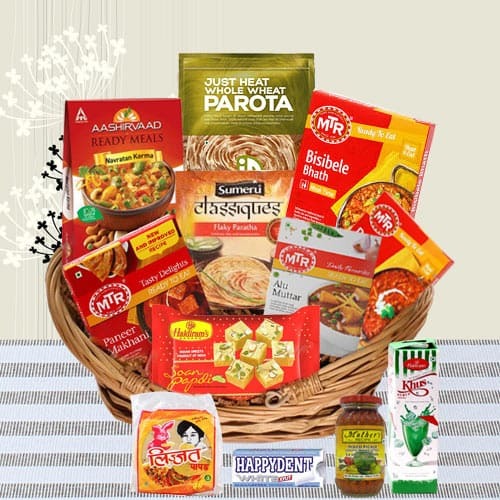 Surprise your special ones by sending this Perfect Socializing North Indian Dinner Gift Hamper that will welcome into their hearts the breeze of love and joy. This delights Gift Basket is sure to please the palette. Filled with a Carton of MTR Ready To Eat Paneer Makhani- 300 Grams, a Carton of MTR Ready To Eat Dal Tadka- 300 Grams, a Pouch of Haldirams Soan Papdi- 250 Grams, a Carton of Aashirvaad Ready Meals Navratan Korma- 285 Grams, a Carton of MTR Ready To Eat Alu Muttar- 300 Grams, a Pouch of Id Just Heat Whole Wheat Parota- 350 Grams (3 Pcs. ), a Pouch of Sumeru Classiques Flaky Paratha (Multi Layered) (4 Pcs. ), a Carton of MTR Ready To Eat Tamarind Rice- 300 Grams, Mothers Mixed Pickle, Haldiram Khus Syrup, Happy-dent Chewing Gum and a Pouch of Mini Lijjat Papad- 200 Grams.